April 4, 2016 / Comments Off on Meet Our New Staff! With the new year, came many exciting changes for the Fond Blanc orphanage! One of the most newsworthy is the introduction of three new, full-time staff members at the orphange. We welcomed Olivia Bunz, Spencer Pursley, and Rob Creviston to our on-site staff in January, and after a brief gap in our American staff presence in Fond Blanc, the kids could not be more excited to have them. The children have been instrumental in helping our new staff members get acclimated to life in Fond Blanc. Olivia, Spencer, and Rob have very quickly settled into their individual roles, grown comfortable in their daily routines, and rapidly picked up on an entirely new language. We thank God for the service and sacrifice of these three wonderful new staff members, and look forward to the positive impact their presence will have on the children of Fond Blanc! Mission Experience: I have been on a number of mission trips through Next Step Ministries, including trips to Jamaica & Haiti. I also have taken a number of trips through my college, including month long trips to China, and Mexico. Work/Educational Background: I got my Bachelor of Science in Sociology from Edgewood College in 2015. I have worked in a number of different fields, including retail, child development, and property management. Favorite thing about Haiti: Hands down, forever and always, will be the kids. They’re the reason we are here! Most looking forward to about living in Haiti: I am probably most excited about getting to see the country and the culture in a different light: you get to see so much more when you’re living here compared to when you visit for a week. 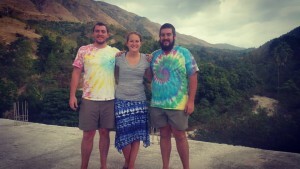 Goals for your time in Fond Blanc: My first goal is to master the Haitian Creole language. My next biggest goal is to help the children accomplish their goals, one of the biggest is for them to learn English. Fun fact about yourself: On paper, I’m 23. In my heart, I’m probably closer to the age of 7. Favorite Creole word: Probably “tanpri”, which means, “please”. We have to remind the kids to say that a lot. Mission Experience: While at Auburn I participated in a mission trip to Ecuador to help build a church with the Building Science department. I also did 2 consecutive summers with Next Step Ministries in Montego Bay, Jamaica as a construction intern. Most recently I was invited by Next Step to serve as a construction leader in Fairbanks, Alaska this past summer. Work/Educational Background: I received my Bachelor’s of Science in Building and Construction from Auburn University. I then completed a Master’s in Integrated Design and Construction, also from Auburn (War Eagle!). Following graduation, I began working for an Atlanta based construction company called Winter Construction as a project engineer. Favorite thing about Haiti: One thing that never ceases to amaze me is the sheer beauty of the place. Every day I am struck with awe at how magnificent the landscape and surrounding views are and am constantly reminded of God’s power and grace. Most looking forward to about living in Haiti: I am extremely excited to get the opportunity to make an impact in the lives of all the children, and in turn see what kind of lasting impressions the experience makes on me. I hope to come away from this trip having made a difference and helping to prepare the next generation to step up and be better equipped to help themselves and their county move forward. Goals for your time in Fond Blanc: Aside from the broader goal of helping the children, I hope to develop lasting and meaningful relationships with both the kids and the staff here at the orphanage. I hope to leave behind a legacy of cooperation and hard work amongst all of the missionaries and Haitians as we continue to grow as an orphanage and a foundation. Fun fact about yourself: I enjoy playing sports or doing pretty much anything active, from having played Lacrosse in college to SCUBA and skydiving, to my most recent adventure where some friends and I completed the St. Jude’s marathon in Memphis, TN. Favorite Creole word: The word, “manje” would certainly be up there as it means both “food” and “to eat”, two of my favorite phrases, both in Haiti and just in general! More recently I have obtained a love/hate relationship with the word “Delco”, which means “generator,” as we spent the better part of 2 months searching for and finally procuring a new one, but thankfully that adventure has come to a close and we have a working power source again! Mission Experience: I worked for Next Step Ministries the past three summers and participated in a few weeklong mission trips with my church youth group. Work/Educational Background: I’m studying accounting at Georgia State University. Most looking forward to about living in Haiti: I’m looking forward to getting to know all of the children in Fond Blanc. Goals for your time in Fond Blanc: I want to show as much love as I can to the kids and people of Fond Blanc. Fun fact about yourself: I really enjoy cooking. Favorite Creole word: My favorite word is “bezwen,” which means, “to need,” and it was one of the first words I learned here.